You've always wanted to own an Oreck vac. Shop the internet and discount stores all day long, you'll never find a price this low! You've seen it in use at five star hotels, motels, retail stores, hospitals, offices and other places where only the finest performance & rock solid durability will do. 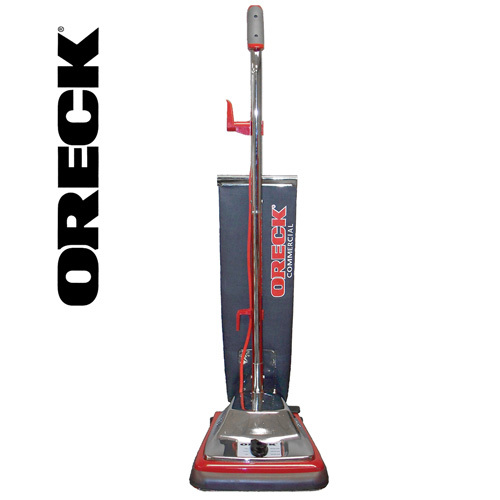 It features an 870 watt motor and a fiberglass roller brush with four bristle strips & double ball bearings to whisk away even deeply embedded dirt in milliseconds. Also features heat overload protection system, a virtually indestructible reinforced fan, see-thru fan housing for fast cleaning, metal bottom, hardened steel foot release pedal, twill cloth bag, 12" cleaning path, large rear wheels for easy maneuvering, metal on/off foot switch, 6-position height adjustment & 50' power cord. Weighs just 14.5 lbs. Factory serviced to meet original quality standards. May have slight cosmetic blemishes.